Icon E 09 indicates issues with the heating element. Most likely, the device has burnt down and needs to be replaced, but it’s not so simple. The flow-through heater in the dishwasher differs from the heater in the washing machine. It is fixed to the recirculation pump for efficient water heating. Since the heater is the part of the circulation pump (or motor), you cannot buy it separately in order to replace it. It is important to take into account the exact model of your Bosch washing machine when buying parts, since error E09 is specific for third generation appliances. Incorrect work of the main module. Water leakage. The gaskets and seals in the appliance wear out over time and the leakage may occur. As a result, water gets into the sump, where the heater and motor are located. Quite often, the cover at the junction with the body loses its tightness. However, it is worth checking not only this, but all other elements as well: nozzles, hoses e t c.
Clogged filter. The drain filter requires regular cleaning. This prevents many problems and other error codes. Because of the clogging, the water circulates slowly, which leads to overheating of the heater. Therefore, the system can display error code E09. How to fix the problem? Open the door and find the mesh filter at the bottom, remove it and rinse it under the tap water. 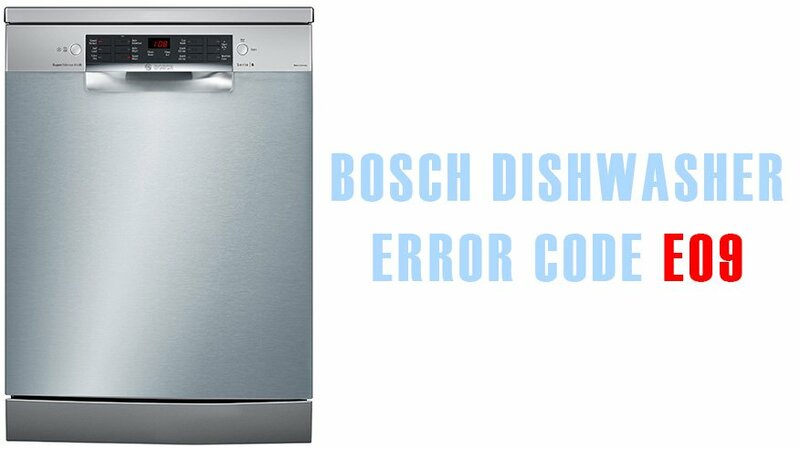 No matter how you try to clean the dishes from the food, small particles still get into the Bosch dishwasher which causes clogs. Poor-quality hard water affects the operation of the dishwasher. Lime scale settles on the heater, forming a thick layer. It takes more time end power for the heater to do its job and eventually it overheats and burns. Use salt to soften water and prevent the appearance of scale. Issues with wiring or thermal sensor occur due to instability in the power grid. If you have not installed a voltage regulator when connecting the dishwasher, we recommend you to do this. Otherwise, the control module may burn. In addition, the shortage may occur during the contact of water with contacts. connect the dishwasher to the power supply. Disconnect the dishwasher from the power grid, water supply, sewage. Remove the plastic clips located at the edges of dishwasher’s body. Unscrew and remove the front part of the equipment. You will see a metal bar under the door. Unscrew it. Unscrew the screws around the perimeter of the sump. Open the tub door, pull out the racks. Remove the filter and the mesh below it. Remove the four screws that hold the circulation pump. Now put a cloth under the appliance and turn it over. Unscrew the screws around the perimeter and remove the sump. Disconnect the wires from the drain pump, unscrew the screws. Turn the pump clockwise and remove it. Remove everything that holds the circulation unit in place: wires, hoses, nozzles. Remove the clamp that holds the heater on the pump. Remove the heater. Install the new part in the reverse order. If you are not sure that the heating element is broken, check the resistance of its contacts using a multimeter.